Guests stream through the Underwater Ocean Tunnel, a glass pathway cut through the middle of a giant water tank that separates visitors from a colorful collage of sea creatures that swim by, sharks and stingrays included. Elsewhere, clown fish and blue regal tang fish, our “Stars of the Sea”, zip past live coral while a giant pacific octopus swims gracefully through his enclosure. And that’s only a few of SEA LIFE’s multiple beautiful displays. Kansas City’s first and only aquarium—SEA LIFE Kansas City Aquarium—is a bright, wondrous attraction that transports guests to an underwater world full of unique creatures and educational opportunities. 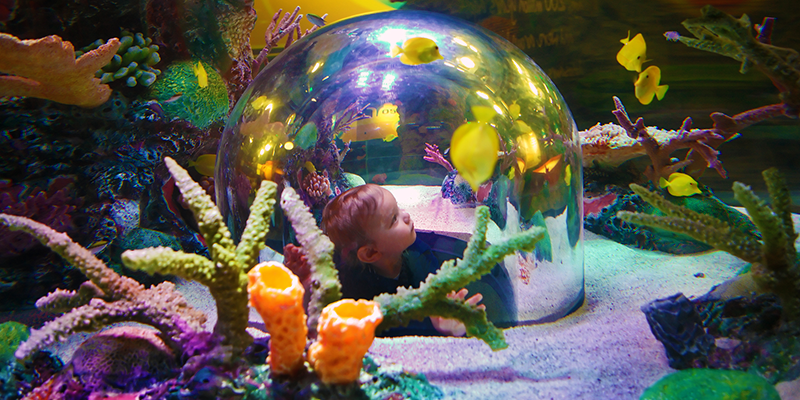 SEA LIFE’s newest exhibit, Doodle Reef, is a mesmerizing, interactive playscape that merges individual imagination with state-of-the-art technology. The $1 million addition was introduced Memorial Weekend of 2016 with an official ribbon cutting ceremony with the Greater Kansas City Chamber of Commerce and a special appearance by Quixotic Cirque Nouveau. 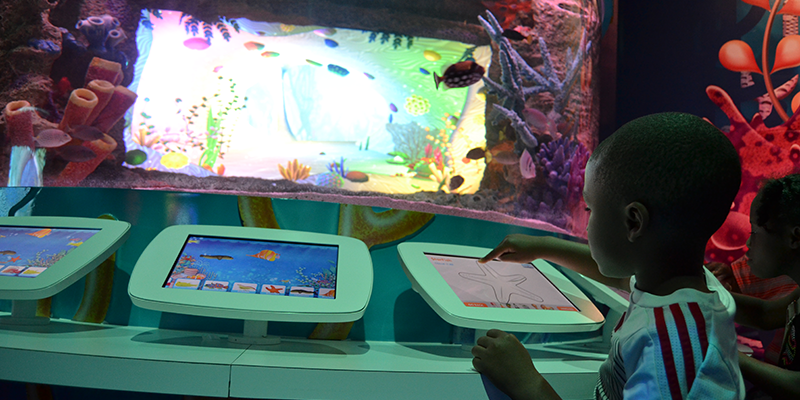 Using specially designed touchscreens, guests can create their very own virtual sea creatures. After selecting a species, guests determine their creation’s color and characteristics at the touch of a button. Once the creature has been designed, it swims across to a screen within a live display right before your eyes. Your creature may disappear, but only to return on an animated, floor-to-ceiling display wall across the room. It’s a terrific way to conclude the exhibit. To see more information about Doodle Reef, visit http://po.st/DoodleReef. The extraordinary SEA LIFE journey begins with a fresh water exhibit, where kids can view questions about creatures such as channel catfish and find answers posted in Fin Facts—a series of wall-mounted signs. Environmental tips found on vibrant displays help kids learn about their impact on the world’s rivers and oceans, and how they can protect both fresh and salt water. Children are also encouraged to collect stamps when the find the special stations in order to become “SEA LIFE Experts.” Young ones who fill their books are awarded a special take-away for their achievement. Interactive displays educate throughout the aquarium, amid rock walls and glass tanks. Visitors learn there are approximately 2,000 types of jellyfish in the world and that corals form the largest living structures on the planet. At the Interactive Rockpool Experience, you can touch horseshoe crabs and chocolate chip sea stars, or a sea urchin may hug your finger. 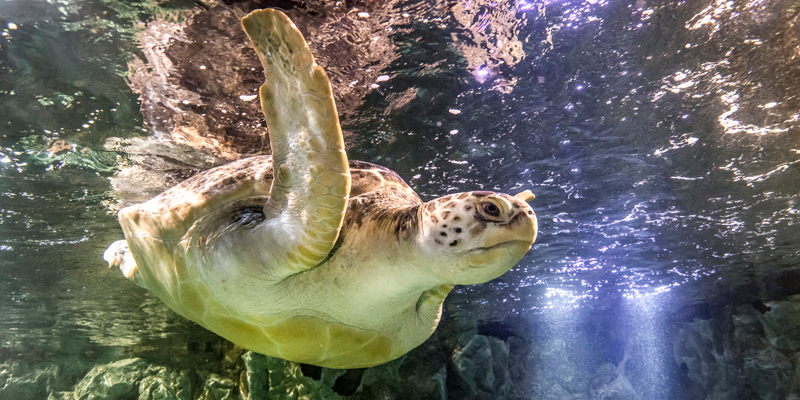 SEA LIFE also houses a green sea turtle—Gertrude—who lost one flipper to severe damage due when she became tangled in fishing line. Held three times daily, Turtle Rescue Theater is just one of many educational programs available. Located in downtown Kansas City, MO in Crown Center, SEA LIFE Kansas City Aquarium belongs to Merlin Entertainments plc, Europe’s Number 1 and the world’s second-largest visitor attraction operator, which includes eight U.S. SEA LIFE Aquarium locations. For more information, go to visitsealife.com/kansas-city to purchase tickets online for the best deal.